Petroleum coke, a byproduct of refining Canadian tar sands, has disturbed residents as it sits on a bank of the Detroit River. OTTAWA — In something resembling a bottle return program, Detroit’s enormous petroleum coke pile, a byproduct of Canadian oil sands, is making its way back to Canada. 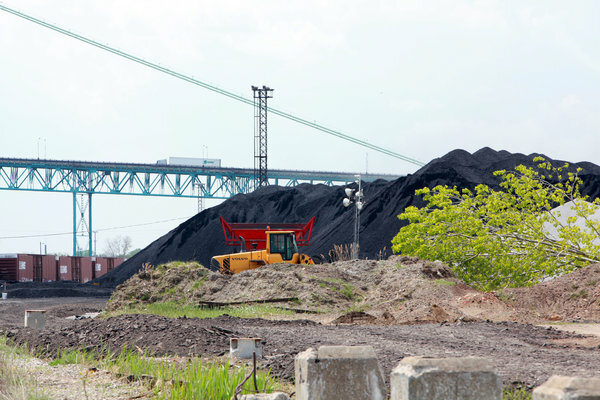 A Canadian electrical power plant, owned by Nova Scotia Power, is chipping away at the three-story-high, blocklong pile of petroleum coke on Detroit’s waterfront. The company is burning the high-carbon, high-sulfur waste product because it is cheaper than natural gas. The uncovered black pile, which has angered and upset some residents of Detroit as well as others across the river in Windsor, Ontario, began appearing this year. Owned by Koch Carbon, a company that is controlled by the industrialists Charles and David Koch, it is a byproduct of processing heavy bitumen piped from the oil sands in Alberta to a Detroit refinery. Its final destination had been something of a mystery. Most petroleum coke, often referred to in the oil industry as petcoke, is used as inexpensive fuel in countries like China, India and Mexico with relatively loose emissions controls. Environmentalists were concerned not only about the impact of the growing pile in Detroit but also about where the material would be burned. In an e-mail, Neera Ritcey, a spokeswoman for Nova Scotia Power, confirmed that the company “bought fuel from that location.” Citing “competitive reasons,” Ms. Ritcey declined to offer specifics about its petcoke purchases. At the same time, the Obama administration is reviewing the Keystone XL pipeline, a project that would send more oil sands bitumen to American refineries and correspondingly increase the amount of American petroleum coke. Residents on both sides of the Detroit River have noted regular visits to the coke pile by two self-unloading, oceangoing bulk carriers owned by Canada Steamship Lines of Montreal. Web sites that track ship movements indicate that one of those ships, the Atlantic Huron, has made several trips this year from Detroit to a coal terminal in Sydney, Nova Scotia. The terminal services two Nova Scotia Power plants that burn petroleum coke, according to regulatory documents. A power station at Point Aconi in Nova Scotia that uses the petcoke has an unusual burning system that minimizes some forms of pollution from high-sulfur fuels. Documents suggest that it is Nova Scotia Power’s heaviest user of petroleum coke. The Point Aconi plant, which opened in 1994, was initially promoted as a way to keep a local coal mine open. But the mine closed anyway and the power station now relies entirely on imported fuel. Nova Scotia produces natural gas from offshore fields and Nova Scotia Power, which was owned by the provincial government until 1992, burns the cleaner fuel in some of its plants. But last year, the company produced 59 percent of its power from coal and petroleum coke, an increase of two percentage points from 2011. In a blog post on the company’s Web site, Wayne O’Connor, the company’s executive vice president for operations, said the increased use of coal and petroleum coke was a matter of price. Despite the regular visits to Detroit by ships to take away the petcoke, the oil sands bitumen refinery there is producing the material at a rate which means the waterfront pile continues to grow. A version of this article appeared in print on June 7, 2013, on page B5 of the New York edition with the headline: Canadian Utility Finds A Use for Detroit’s Pile Of Oil Sands Byproduct.